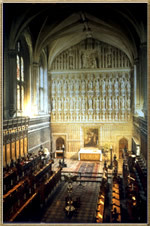 Little is known about the life of this English composer except that he served as Informator choristarum at Magdalen College from 1543-8 and was a Gentleman of the Chapel Royal from 1553 until his death, within weeks of Queen Elizabeth I's coronation on January 17, 1559. Until fairly recently, the full scope of Sheppard's achievement was little known due to so much of his music being imperfectly preserved in the surviving sources. Lately, Sheppard has undergone a reassessment due to scholarly restoration and reconstruction of his scores allowing them to be performed once more. He is now seen as second only to Byrd in sheer number of works composed and equal in artistic significance to his contemporaries Tallis and Tye.